Contributing Russian Identity: Principles of "Trans-culture" and "Critical Universality"
The article focuses on the analysis of political and philosophical ideas of M.N. Ep- stein, and particularly on his concept of “trans-culture”. The purpose of the article is to explore ways to overcome the crisis of national identity by the principles of “trans-culture” and “critical universality”, developed by philosopher M.N. Epstein. The article examines such topics as criticism of totalitarian culture in the USSR, critique of multiculturalism, Russian regionalism, selfidentity of the Russian Diaspora in the USA, etc. The article is based on the texts of M.N. Epstein and on the interview taken by the author in 2011. The author concludes that the principles of “trans-culture” and “critical universality” developed by Epstein may be considered as a “bridge”, which leads from national-civilizational identity towards building global civil society. Keywords: national identity crisis; trans-culture; critical universality, critical analysis of multiculturalism, M.N. Epstein. The paper highlights the problem of the necessity of person’s spiritual self-release in I.A.Ilyin’s anthropological interpretation of Hegel’s philosophy. Person’s realization of freedom is considered as the summary of self-reflection, choice and practical act. Keywords: freedom, spiritual self-release, existentialism, concretization of an absolute, person’s self-determination, theology. The article examines the constitutional law foundations of civil society institutes’ functioning. The author justifies the need for the participation of Russian society in the state management process. Keywords: civil society, Russian society, democracy, personality, rights and freedoms of man and citizen, legal state. Altai State University, Barnaul, Russia. Constitutional and legal fictions as a phenomenon of modern legal reality are investigated in the article. Legal fiction is a phenomenon, in which fictitious position is declared as an existing one; it acquires binding character due to its reflection in the norms of law, or vice versa, the actual situation is recognized as non-existent. Sectorial features of the constitutional and legal fictions mean that they have a vast sphere of action and affect priority areas of life; in their majority, they differ in a pronounced political and ideological orientation, and are observed in special cases. Such cases include abstract legal concepts, terms, understanding and interpretation of which are ambiguous; situations when constitutional and legal norms do not receive proper specification and development in other normative legal acts; “transformation” of the norms of the Constitution by current legislation or decisions of the Constitutional Court of the Russian Federation, by which the author understands change (sometimes significant) of meaning of its individual provisions without formal invasion into constitutional text. Special attention is paid to the classifications and specific manifestations of fictions in the constitutional law of the Russian Federation. Depending on the level of legal force, fictions can be subdivided into constitutional and sub-constitutional; depending on the content – into material, procedural and mixed; depending on the duration of the existence – into static and dynamic; depending on expression form – into open and hidden (latent); depending on the attitude towards actual circumstances – into positive and negative; depending on institutions of the constitutional law of Russia – into fictions in foundations of the constitutional system, rights and freedoms of human being and citizen, federal structure, institution of the president, parliamentary law, legislative process, and local self-government. As a result, constitutional and legal fictions are defined as normative provisions contained in the Constitution of the Russian Federation and other sources of the constitutional law that recognize condition, which does not exist as existing, and vice versa, and also have industry features. The author underlines the ambiguous role of fictions in the constitutional and legal regulation of social relations, and the need to optimize their use. Keywords: constitutional fiction; reality of constitutional provisions; fictitiousness of constitutional provisions; legal life; transformation of the Constitution. 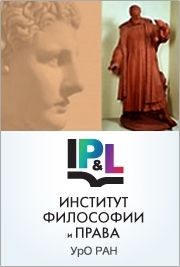 Postgraduate student, Institute of Philosophy and Law, Ural Branch of the Russian Academy of Sciences. Ekaterinburg. The paper offers doctrinal analysis of the effectiveness of implementation models of the constitution, taking into account the existing constitutional theory and practice. The author defines the concept of the «implementation model of the constitution», marks out the criteria for definition of the models and suggests five implementation models of the constitution: model of formal implementation, model of mediated implementation, model of limited implementation, model of direct implementation, model of living implementation. The author formulates advantages and peculiarities of each model and considers those models and their continuous development as part of constitutional process. In addition, the article analyzes factors, which define the choice of particular model in concrete legal relationship and the reasons for the normative fixing of the model of direct implementation of constitution. The author concludes that direct action of the constitution as integral principle of the implementation of constitution resulted from its substantial qualities has attributive value. Keywords: constitution, implementation of constitution, implementation model, direct action, constitutionalism. The article is devoted to the contents of the right of ownership. The author in detail analyzes theoretical opinions about elements of the right of ownership and proposes a new theoretical model of the right of ownership. Keywords: property, right of ownership, individual right, legal relation, theoretical model of the right of ownership. Candidate of Political Science, junior researcher, Perm Division, Institute of Philosophy and Law, Ural Branch of Russian Academy of Sciences, Perm. The article considers the diverse integration projects in modern Russia. Special attention is given to the integration of regions in Russia and to the formation of Perm's Region. Keywords: integration, political integration, integration of regions in Russia. The author defines the classification criteria for direct governor elections in Russia, determines the types of elections based on their competitiveness and prediction and analyzes the impact of participation of power structures agents(«siloviki») on competitiveness and prediction of elections. Keywords: direct governor elections in Russia, competitiveness and prediction of election, power structures agents («siloviki»), loyalty and opposition to federal power, role of power structures in regional politics, professionalism of administrative personnel. The aim of the article is to analyze theories of electoral cycles, to determinate electoral cycles in Russia and to demonstrate the influence of elections upon political development in Russia. Keywords: electoral cycle, typology of elections, political development.